This is the perfect time of year to serve this hors d'oeuvres at your next party. Imagine a snowman standing more than a foot tall, on a platter surrounded by fresh veggies, crisp crackers and salami. Guests will wonder what they’re supposed to do with him, until they dip into his luscious "snow" or cut into him for a chunk of his insides. Then they’ll keep returning for more, until the poor snowman is left looking like his brothers Frosty or Olaf on a warm day. Here’s the recipe which is just one of 75 recipes in The Phony Gourmet, which is now 75% off at a clearance price of $5 plus postage and handling. This hardback cookbook originally sold for $15. 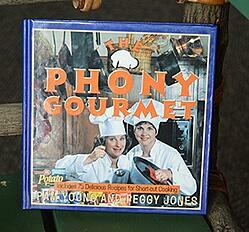 Just click on the cover of the cookbook and it'll take you to it. 1. In a medium bowl, mix together cream cheese, garlic, seasoned salt, onion powder, and milk until smooth. 2. Place the larger loaf of bread on a large serving platter. Frost with half the cream cheese mixture. Stick the wooden skewer through the middle of the large loaf. Stick the medium-size loaf onto the skewer to make the second “snowball.” Frost the second ball, leaving enough cream cheese mixture to frost the third ball. Stick the French roll onto the skewer for the snowman’s head. Frost, and decorate, using items suggested in the ingredients. The Phony Gourmet came close to being a cooking show on television, but my sister and I weren’t willing to live five months out of the year in LA. Our six kids needed us at home. This video is the musical open from the pilot show. In the open you'll see that we disguised ourselves to go to the grocery store so our friends wouldn't know we were buying convenience foods and would think we cooked from scratch.